Guido Biasi painter, born in Naples in 1933. Guido Biasi studied at the Artistic High School and at the College of Fine Arts in his hometown. In 1954 he became a member of Movimento di Pittura Nucleare (Nuclear Painting Movement) and in 1957 he signed the Abisola Marina Manifesto with Colucci, Piero Manzoni, Sordini and Verga. The following year he took part in the establishment of “Gruppo 58” – with Luca (Luigi Castellano), Del Pezzo, Di Bello and Fergola. He wrote down the manifesto of the group. 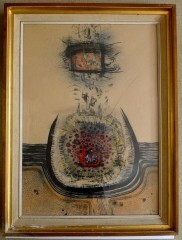 From 1959 on, he worked for the reviews “Documento sud” and “Linea sud”.In 1960, he was in New York where he took part in the International Exhibition of Surrealism; “Surrealist Intrusion in the Enchanters’ Domain”, by André Breton and Marcel Duchamp. In the same year he moved to Paris where he remained. In the early years of his Paris life he attended the group “Phases”; he worked for the Homonymous review, and also for the review “Edda”, published in Brussels. From 1968 onwards he would often go back to Milan, even for long stays. He dies in Paris in 1983.The list of his one-man exhibitions shows the great interest that galleries all over Europe had in his works since the early 1960s. He was in Basle, Frankfurt, Hamburg, Cologne, London, Paris. In 1964 he was in New York and again in Brussels, Amsterdam, Stockholm, Grenoble, Malmoe, Bourges, Château roux, etc.In Italy we remember his presence at the Biennale di Venezia (1972 and 1978), Quadriennale di Roma (1972). Very important was his presence at the Stedelijk Museum in Amsterdam (1969), at the invitation to the Biennale Internazionale in Sao Paulo, Brasil (1972) and the XXV Salone della Giovane Pittura di Parigi (1974).Some of the most qualified scholars have written about him in Italy. Among them: Barilli, Caramel, Crispol-ti, Fagone, Menna, Sanguineti, Schwarz and Varga.